Macs can sync Mail, Calendars, and even Notes with Android phones and tablets with virtually the same seamless nature as Macs sync through iCloud with other Apple devices like the iPhone, iPad, or iPod touch. The only requirement to sync a Mac with an Android device is that you have a Gmail (Google) account, which if you’re using Android you almost certainly do. If you have set up iCloud before, you will find setting up Android and Google syncing with a Mac to be very similar and just as easy. The process is basically the same as setting up a standard mail account with OS X, and if you haven’t done it yet then Mail app will become active with the Gmail account you use. Mail syncs practically immediately, and additions to the Notes app in OS X 10.8+ are synced to Android via Gmail and tagged as Notes. As a result, pictures sync between OS X Notes and Gmail this way, despite not doing the same when syncing from OS X to iOS Notes, which in an obvious way makes syncing from a Mac to Android oddly better than to an iPhone, at least for the time being while that limitation exists. Calendars sync between iCal to Google Calendar as expected. Now that Mail, Notes, and Calendars are syncing between Android and Mac OS X, what about your iTunes music? You can’t do it directly through iTunes itself, but you can sync your iTunes library and all of it’s music to any Android device easily with the free WinAmp app. 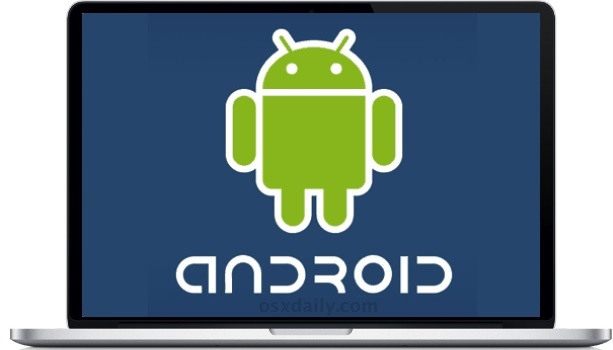 Going beyond the usual stuff, you can even move files between OS X and Android devices by using the free official Android File Transfer tool, further demonstrating just how easy and full featured it is to work with an Android device and a Mac. You know, I used my friends Samsung Android for a while and I admit I liked it. If there was no iPhone, it would be my phone of choice, but my iPhone 5 is the best phone I’ve ever used hands down. Some at work are getting Androids though, it’s good to know if I get assigned one I will be able to sync it just as easy. In regards to notes, yes you can sync them this method but you will only be able to view them through your gmail app on android by viewing the Notes label. This does not allow you to edit the notes, only view. which is a little pointless. It might be a good idea to show a method of being able to create and edit notes. You can also sync Google contacts with OS X by setting up a separate Carddav account with your Google credentials. iNotes is an excellent little app available on Google Playstore that syncs with the notes data from GMail. For better syncing of Notes across platforms, try Evernote instead. It’s free, holds and displays rich media, and has great apps on OS X, Windows, iOS, Android. This will sync Google calendar entries to iCal, but it will not sync the entries in your iCal to Google calendar or your Android phone. I wish there was an easy way to do that. For syncing notes between Mac and Gmail, i found it works only in one direction – from Mac to Gmail. But not the other direction from Gmail to Mac. – I created a note in Notes.app and it syncs to Gmail, under lable “Notes” correctly. – I created a note in Gmail and put it under lable “Notes”. It never syncs to Notes.app. Is there anyone has similiar issue? And will there be a fix? same issue here…still combing the web for viable solutions. otherwise, i might just go for evernote or other 3rd party apps.